Dave Delaney. Speaker on business networking using online and offline tools and technqiues to grow and nurture your profesisonal networking. Dave Delaney is the chief connector at Networking For Nice People. He is an acclaimed keynote speaker on the topics of business networking and social media marketing. His presentations are humorous, educational and engaging for events of all sizes. Dave has provided keynote presentations for companies, conferences, and organizations like Google, LinkedIn, UPS Store, American Marketing Association, SXSW Interactive, Hubspot's Inbound, HealthStream, and HCA. - Renee McAllister, LinkedIn Inc.
- Nicole (Belt) Cox, The UPS Store. While you are waiting, take a look at the latest blog content. The Master Communicator’s Secret Weapon - Dave Delaney will share three key skills that you can use each day to improve your communication with colleagues, clients, friends, and family. You will learn to listen better, not to fear failure, and to accept opportunities with an empathetic, open-mind. Take what you learn and apply it to your work. Learn more. The Worst LinkedIn Profile In The World - This hilariously informative presentation introduces the fictitious, Jerry Larry. Jerry has made every mistake you can possibly make on LinkedIn. Dave will walk you through each error to entertain and educate your audience on the best ways to improve their LinkedIn profiles. Learn common mistakes and lesser known blunders you could be doing right now. Dave will leave the audience scrambling to check their LinkedIn profiles (and some quickly updating theirs too). 2,500 Miles of Content Marketing - In 2009, Dave embarked on a 2,500 mile road trip in a restored VW bus from Nashville to Las Vegas. The journey included customer meet-ups, media exposure, social media content, and enough photos, videos, and ideas to promote his company, increase brand awareness, and improve customer relationships. Dave Delaney did a wonderful job of presenting networking and LinkedIn usage best practices to our employees. He was easy to work with from concept to delivery and our learners appreciated his easy-to-understand delivery style. If you are looking for someone to share expertise in this era of digital networking and marketing, Dave would be a great person to engage with. Yes, he is a great speaker, and keeps the audience engaged. I've sat back and watched, and he truly lives and breathes what he preaches. He *IS* that good at networking, he *IS* on the money with his recommendations about building relationships. And he has shown the ability to take those lessons across many different realms, from seminars to books to podcasts. That is the true test of one who has mastered a skillset. He has mastered it, and knows how to evangelize it to a full team or organization. If you get a chance to work with Dave, you won't forget it. And true to his mantra, he won't forget you. As the VP of Programming for IABC Nashville, I found Dave via an online search and hired him to present at our professional development luncheon. He spoke on the topic of effectively using LinkedIn. He was very easy to work with prior to and at the event. He was prompt and ready to get to work when he arrived. He was very personable to our guests and provided great insight that resonated with the group. His delivery was professional, yet not stuffy or overly formal. He infused the perfect amount of humor to create a comfortable atmosphere for learning and quickly built rapport and credibility throughout his presentation. I received several positive comments about him and the subject he covered with our group. I would recommend him to present/train on any topic related to social media, digital marketing or business networking. Dave Delaney spoke at Tweetstock8 and did an absolutely amazing job. He had us engaged in his story, nodding our heads in affinity, smiling and laughing, and before we knew it we were learning something without even knowing it was happening, without even trying. That’s how good a speaker Dave is. Dave’s presentation on networking is him taking Canadian/Southern hospitality to another level, it’s his version of lending a helping hand to a neighbour, it comes naturally to him. He’s able to present cutting edge ideas in a way that’s as laid back and comfortable as having a cup of coffee. And I should know because I took Dave’s coffee challenge and had three coffees with people I met at Tweetstock......and as a result I’ve booked a gig. So read his book and bring him in to speak at your next event. I promise you’ll like him instantly. Dave delivered a strong and relevant presentation to our leadership group. His material on the importance of networking was clear, entertaining, and full of valuable take-aways. We received many positive comments from our members, who were eager to put his tips into practice. I work in public relations for The UPS Store and we recently approached Dave Delaney to speak at an event for small business owners. He exceeded our expectations. Dave tapped into many common pain points facing SBOs today - lack of time/resources and keeping up with the rapid pace of change, especially in technology. Being a business owner, he was able to empathize with the audience and offer them real tips and advice they can use. His speech was authentic, informative and very well received by our audience. We asked Dave to come and speak to a group of law firms (about 10) on the topic of blogging and social media. He did a great job, provided us with a ton of insight and action items. The group thought he was very informative and helpful, and would definitely have him back in the future. Would highly recommend him as a speaker, coach, consultant in social media and blog content. Dave gave a networking talk to a convocation of two cohorts of aspiring software engineers/web developers at Nashville Software School. Dave did a great job of helping our students understand the importance of building their network and relationships in the various communities they participate in. Dave's an engaging speaker who is clearly knowledgeable but also friendly and approachable so he's easy for a group to listen to and connect with. For our students one of the important things that Dave did was not only talk at a conceptual and strategy level about the importance of networking but also talk about specific actions that they could immediately take to start to build and extend their networks. Also, the actions Dave recommended were a balanced mix that combined leveraging social networks and digital resources such as Linkedin but also old-fashioned in-person connecting with people. We think so much of Dave's advice that we gave each of our students a copy of Dave's book for their future reference. I'd highly recommend Dave to anyone looking for a great event or seminar speaker. Dave spoke at our LinkedIn Live event. Dave blew me away. (as well as the audience) His engaging personality and ability to connect with his listeners makes him an amazing speaker. Dave drove attendees to connect with one another and drove further engagement of our members. On top of being an amazing and connected speaker, he is an amazing individual. I looked to him to be a speaker for our webinar series and he supported my efforts with no ask in return. I would encourage individuals and groups to reach out to Dave to have him speak at an event. You won't be sorry! 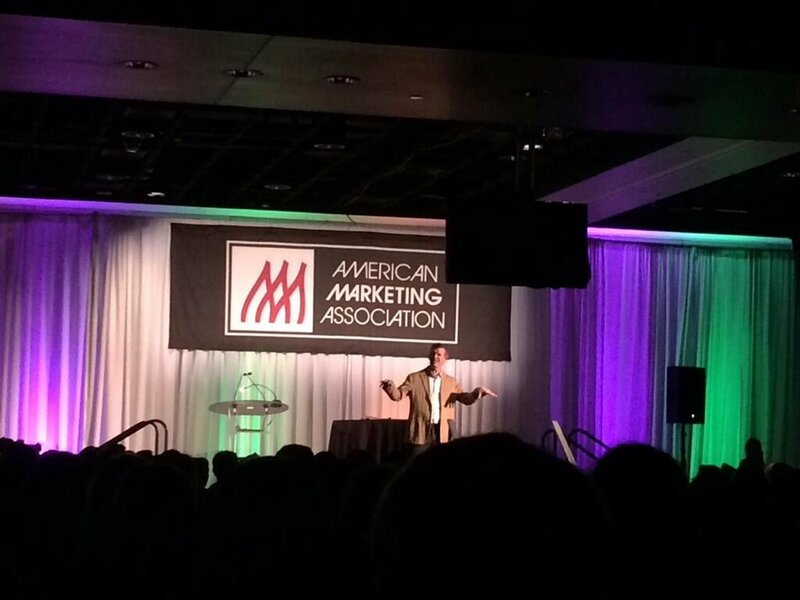 Dave spoke to over 1,200 college students at the 36th annual American Marketing Association's International Collegiate Conference. Keeping the attention of college students is a very hard task -- let alone keeping the attention of 1,200 students. However, Dave did just that. His talk on "Your Network is More Important Than Your Resume" was perfect for the audience. Clearly, Dave is an expert in his field and was a great asset to our students at the conference. I recommend him for other speaking events! Dave is not only extremely knowledgeable, he is engaging and passionate about helping people get to the next level in their life. As a speaker, Dave captured an entire audience for over an hour, a feat that isn't easy by any stretch. His humour, combined with both theory and tactics and friendly personality makes him a must-have to start out the morning of any conference or event. • His in-depth knowledge & unique insight on ways that technology can be used to form strong professional connections with the right people. • His ability to discuss this subject with an audience that contained a wide range of interests & abilities regarding technology & communication tools. Mathew Laughlin, Association of Talent Development. It was so great to work with Dave for MoSo. Our attendees had wonderful things to say about Dave's session and it was great to see him stick around and enjoy the rest of MoSo. We would definitely be keen to invite him to speak again in the future! Dave Delaney is genuinely a nice guy who is passionate about his community and has a vast knowledge of digital marketing. As the Programming Chair for NAMA (Nashville American Marketing Association), when it came time to choose speakers for a panel discussion on success stories in Nashville, Dave came right to mind. He is an expert on social strategy and an early adapter on all things technology. His speaking skills are superb and he is a pleasure to work with. Dave proved to be a great resource of knowledge on business networking, and our conference attendees were pleased with all of the information they took away from his sessions. Dave gave a lunch presentation to our professional organization and he was well received. Our group very much enjoyed his presentation. They found it to be engaging and helpful. I recommend him for educating others on the value of networking. I have spoken at an event Dave helped organize and I recruited Dave as a speaker for a professional marketing organization where I served on the board. On both sides of that speaker-organizer interaction, I found Dave to be a consummate professional. There are many business speakers who talk through theories, case studies, and 3rd party observation. Dave is not one of those speakers. He practices what he preaches and that makes his message that much more effective. I have followed Dave’s exploits through social media for several years. He understands community building in marketing and how to engage people both IRL and online. Most importantly, he’s genuine and he’s a good guy. It’s hard to find people like that. Dave Delaney has spoken at both of our Customer Conferences and they have loved him every time. His vast knowledge of social media has given our customers invaluable information that they can take and apply to their businesses immediately. His presentations are full of information, funny, and interesting. Dave is your passionate social media expert that will always make you want more information on the topic. 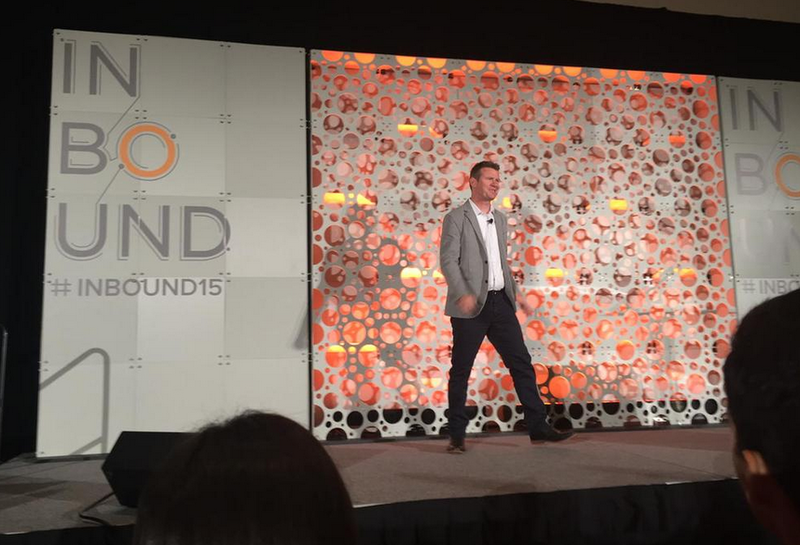 If you need a social media speaker for your next event, Dave is your perfect candidate. You will love him! Dave was the featured speaker at our Executive Networking Forum at the Nashville City Club and gave us all some great takeaways for our businesses. Dave's in-depth knowledge about all things online - including content marketing, SEO, Twitter and E-mail marketing - was obvious. His relaxed conversational style and effective presentation skills made the time fly by. Can't wait to hear him again! We've invited Dave several times to speak to the technology and communications community at Vanderbilt University and it's always like money in the bank. I know when Dave speaks I'll learn quite a bit, I'll laugh even more, and I'll walk away re-energized about my work. Dave deftly weaves personal stories, professional examples and a very healthy dose of common sense into presentations that never fail to engage, educate, enlighten and entertain his audience. His genuine interest in and building community has had a significant impact on Nashville. Invite him as a speaker and he'll leave as a friend. Dave is an engaging and creative social media entrepreneur. He has the ability to capture the attention of an audience, or a client, and involve them in the process in such a way that it is fun and educational. Dave is a practitioner as well as an innovator of social media marketing strategy. His creativity and drive to devise and execute original, thought-provoking, and compulsive-attention-grabbing marketing campaigns are skills few can match. I follow Dave on Twitter, Facebook, and read his blog regularly, just to see what he is going to come up with next! Dave spoke at TANS Annual Conference about recruitment branding. He did a wonderful job of relating real world branding examples to the world of talent attraction, bringing in a ton of data. Great job and thanks for presenting! Contact us to book Dave for your company event or conference today. Here is the latest from our blog.